see it. Sand dunes mostly. We didn’t want to stay long in Port Denison, I read that the controlling government department expects boats to register with them and pay a mooring fee. Have to be joking, with a free anchorages up the coast we left at 6am the next morning. I knew the harbour was a fair distance from the town so there was little else to keep us there. 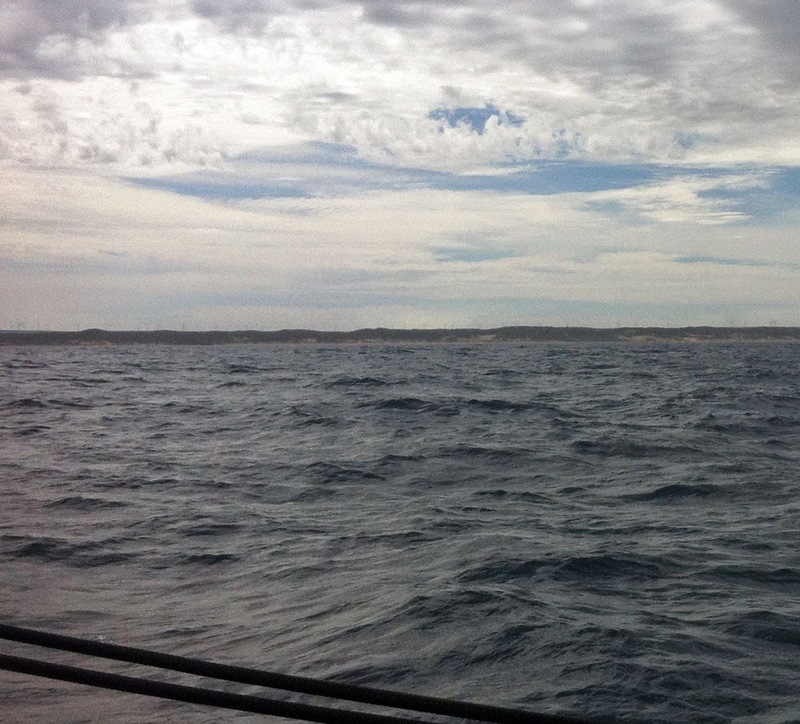 It was 41 miles to Geraldton and I saw the coastal route inside the reefs was clear of any hazards. The Southerly was already filling in, after the first hour we were on a broad reach (wind on an angle from behind) hurtling along at 6 knots, with 1 to 1.5m waves sweeping under us. 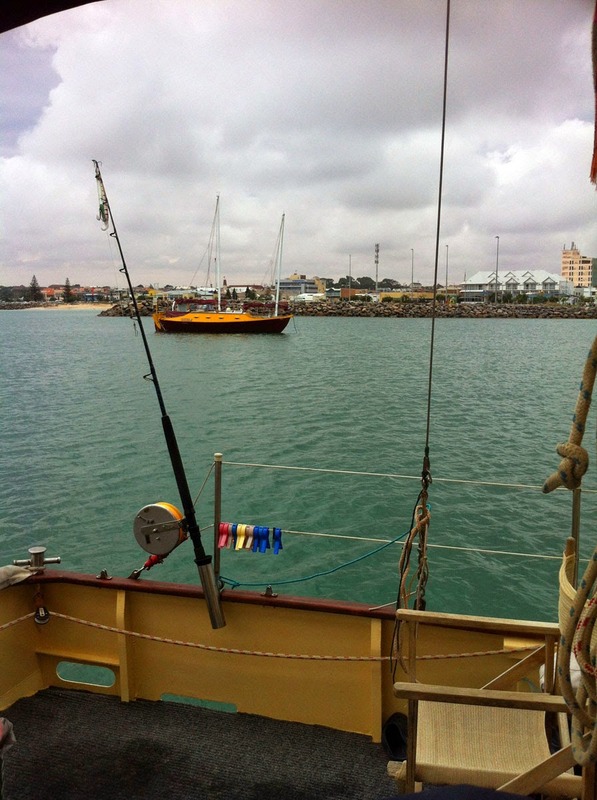 We made the Geraldton shipping channel averaging over 5 knots (fastest 40 mile leg ever! ), the final 3 miles to windward slowed that average somewhat. We had reefed downwind to make the point, then shaken out reefs to make windward speed up the channel, but we made the town beach anchorage, motoring the final 1/2mile dead into the 20+ knot breeze, next to one other yacht, right in front of the city centre. All this reefing and shaking out reefs, certainly is exercise, for arms, no leg work involved. If I’m steering I usually ask Susie to reef or drop the sails. 200 miles in 5 days is pretty slow. I thought we’d do it in 2 or 3. It was the most arduous thing we had done on a boat but we learnt a lot. Ashiki had a few litres of water in her bilge, which surprised us. It was sponged out after the storm (too little for the electric bilge pump to pick up) and none had come back in. Looks like water had entered via the bilge pump thru-hulls which are situated just under the rub rails. While sailing fast in deep swell (and while hove to in a storm..) the rub rails are frequently submersed, so even the little U bend in the bilge pump pipe wasn’t high enough to stop the water flow. 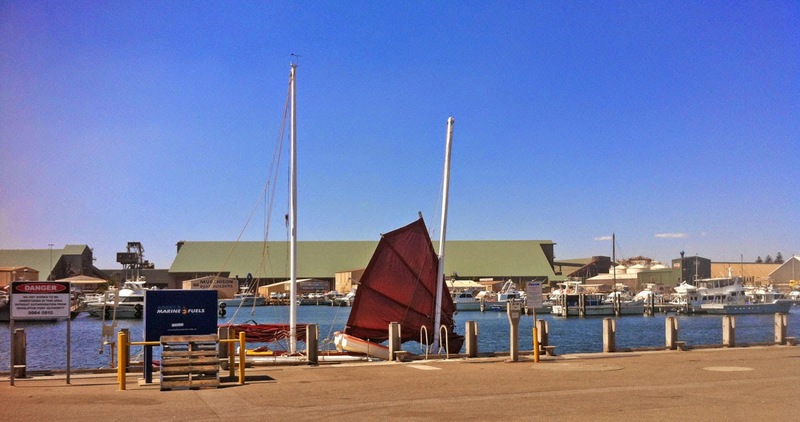 a Bruce Roberts "Pacific Coast Fisherman", 38' motorsailer. The owner chose this design for extensive WA coast cruising. Has a real engine room, full standing headroom walk around the diesel. Just like Bunbury and every other coastal hub, huge bulk carriers, or grain carrying ships are escorted in and out daily. WA grows more grain than the 3 “big” states, Queensland, New South Wales and Victoria do combined. 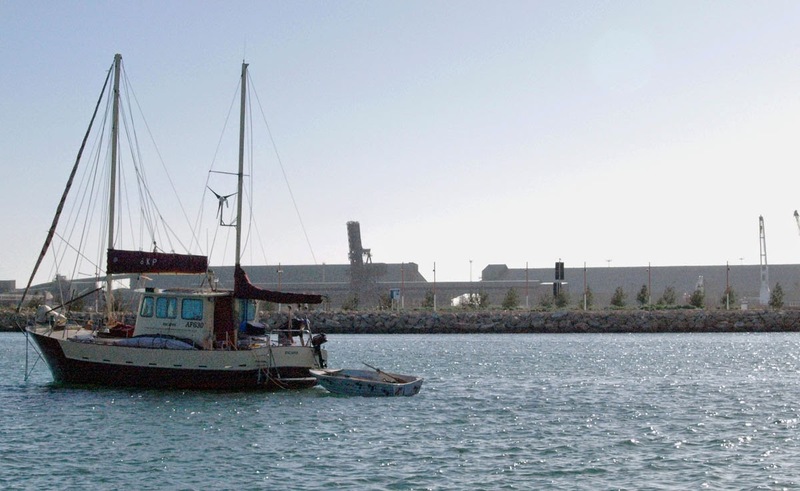 There be more than just mining here though Geraldton port ships iron ore too. In fact WA is unique in that its economy has always been export orientated since settlement, the east coast has their domestic market to supply. As true to form, Geralton’s downtown looks pretty neat, century old buildings with the odd assortment of ’30s art deco. 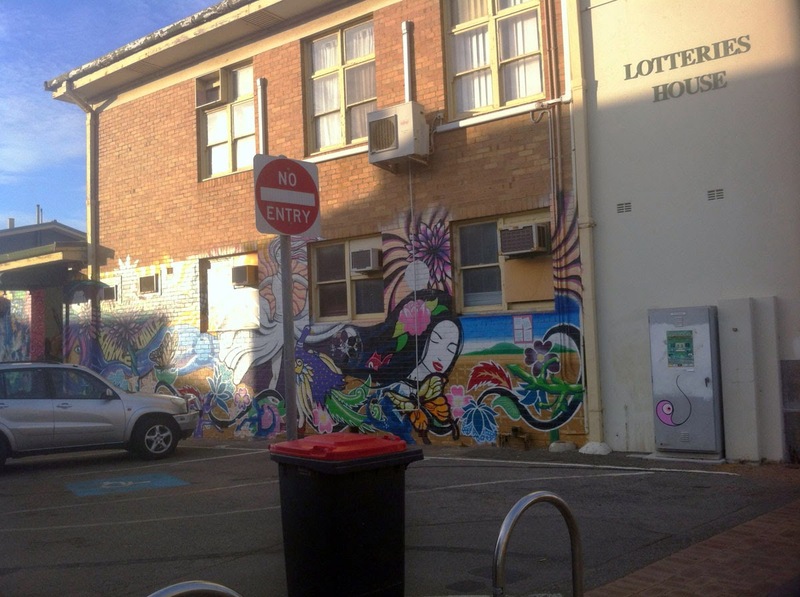 The area has a genuine inner city feel, even though it is a small town. The residential area behind the city is attractive too. Plenty of old weatherboard cottages surrounded by lush gardens on large blocks. We stumbled upon these looking for the one supermarket that was open on Sunday. 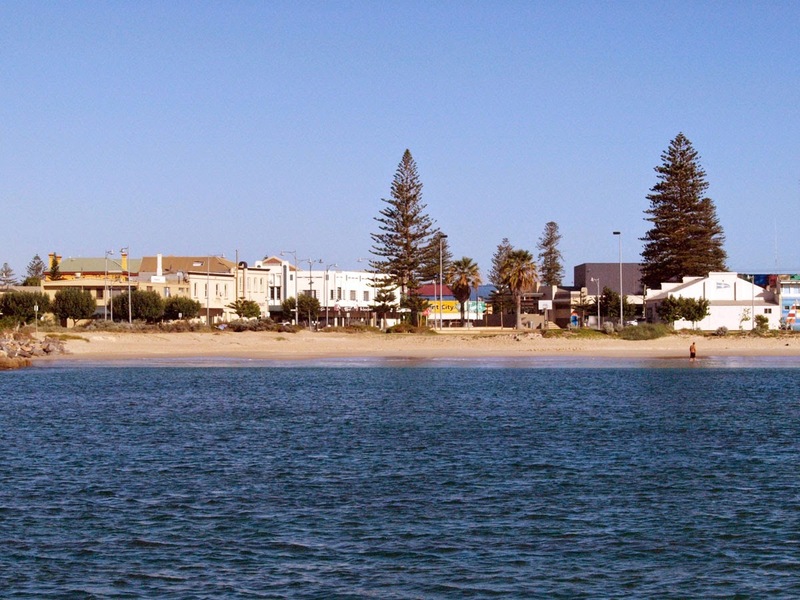 Geraldton has apparently resisted 7 days trading till now, they were still debating it in the local newspaper. We found the yacht chandlery too, replaced our lost sea anchor and bought a couple one way valves for the bilge pump through hulls. Ashiki viewed from the other boat. The fishing boat harbour reminded us that Geraldton is really the centre of WA’s crayfish industry and fortunes have been made and still are made here. There were far more crayboats here than anywhere else. We saw these vessels all along the coast, we just sailed over 300 miles of it, and there was always a cray boat insight. Never alone along this coast.. and I thought WA was “remote”! Didn’t like playing dodgem cars with the pots though, we found long lines of them 18 miles out. The catch goes to China and Japan who have a huge appetite for the crustacean, and they must be delivered live, by air. I’ve seen them in China, in fish tanks at the front of restaurants. Thus the high price and high profits. It’s a gold rush, though subdued now with quotas. To rub salt in the wound, I asked the retired fisherman we met what he had been doing for 40 years, he said “on holiday mostly”! Because the season never goes more than half a year! So he fitted in 2 world circumnavigations on sailing boats. What a job! But the real impact doesn’t hit home till we see the Abrolhos.. thats another story. Love reading the stories of your adventures. Keep 'em coming. Sorry, I'm in shock someone actually reads my ramblings.. Your ramblings are very entertaining, and more importantly, very informative about your boat and it's junk rig! We are wondering if we should built this boat and the junk rig is the way to go as far as I am concerned. Thanks for the compliment. Which reminds me, maybe I should do a review of the Badger design..